Author contributions: Fluegen G designed the report and analyzed and interpreted the data; Fluegen G, Kroepil F, Knoefel WT and Topp SA were attending doctors of the patient; Topp SA performed the operation; Jankowiak F performed pathological examinations; Zacarias Foehrding L, Knoefel WT and Topp SA critically revised the report and gave important intellectual input. Intrahepatic endometriosis is one of the rarest forms of atypical endometriosis; only eighteen cases have been reported in the English literature. We describe the case of a 32-year-old woman, who presented with persistent, non-cyclical upper right quadrant abdominal pain, a central liver cyst, and no history of endometriosis. Three years previous, she was diagnosed with an intrahepatic cyst. The lesion progressed and two laparoscopic deroofing-operations were performed, yet the diagnosis of intrahepatic endometriosis was never reached. She presented in our clinic with further progress of the cyst as well as obstruction of the intrahepatic biliary system. The magnetic resonance imaging showed a 9.5 cm × 12 cm, lobulated intrahepatic cyst. We performed an ultrasonic pericystectomy. Immunostaining confirmed intrahepatic endometriosis. Only one of the previously described eighteen patients with intrahepatic endometriosis presented with cyclical pain in the upper right abdominal quadrant accompanying menstruation. This lack of a “typical” clinic makes it challenging to diagnose extragonadal endometriosis without histopathology. A previous history of endometriosis was described in only twelve cases, thus the diagnosis of this condition should not be limited to patients with a known history of endometriosis. Six of 18 patients were postmenopausal, demonstrating this condition is not limited to women of reproductive age. A preoperative diagnosis was only reached in seven of the previously described cases, highlighting the importance of preoperative biopsies. Yet due to the potential adverse effects, a transhepatic biopsy must be discussed individually. Although rare, intrahepatic endometriosis should always be considered as a differential diagnosis in women with recurrent hepatic cysts, regardless of age or previous medical history. In such cases, histology is essential and a pericystectomy should be performed as standard of care. Core tip: We describe the case of a 32-year-old woman who presented with non-cyclical upper right quadrant abdominal pain and a central liver cyst. Upon ultrasonic pericystectomy, the patient was diagnosed with intrahepatic endometriosis. The lack of “typical” clinical symptoms makes it challenging to diagnose extragonadal endometriosis without histopathology. Only eighteen cases of intrahepatic endometriosis have been reported in the literature, with only one reporting cyclical pain. Six of the eighteen patients were postmenopausal, and in twelve cases a previous history of endometriosis was described. Intrahepatic endometriosis should always be considered as a differential diagnosis in women of any age. Endometriosis, a common clinical condition most commonly noted in the pelvis, is found in approximately 6%-10% of women of reproductive age and approximately 2.5% of postmenopausal women. Atypical endometriosis, when the condition is found in extrapelvic regions, is rare. Endometrial tissue deposits have been described in almost all organs of the human body, and even very rarely in males. Intrahepatic endometriosis is one of the rarest forms of atypical endometriosis. Since the first description of intrahepatic endometriosis in 1986, only 18 cases have been reported in the English literature[5-20]. We describe the case of a 32-year-old woman, who presented with persistent upper right quadrant abdominal pain and a central liver cyst. 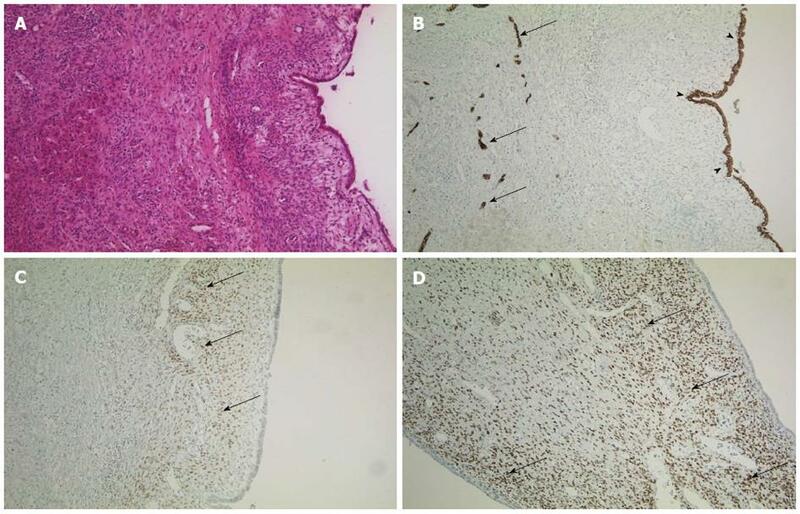 We discuss the occurrence of intrahepatic endometriosis in review of the previously published eighteen cases and summarize the proposed pathogenesis of this rare condition. A 32-year-old woman, nulligravida, nullipara, consulted our hospital with constant right upper quadrant abdominal tenderness. She had no history of endometriosis. Three years previous, she was diagnosed with an intrahepatic cyst in segment IV. The lesion was closely monitored and upon progression two laparoscopic deroofing-operations, one in combination with a cholecystectomy, were performed. Due to further progression of the cyst with obstruction of the intrahepatic biliary system and resulting jaundice, multiple endoscopic retrograde cholangio pancreaticography were performed and on three occasions transhepatic drains were applied. As the patient presented at our clinic, the preoperative magnetic resonance imaging showed a 9.5 cm × 12 cm, lobulated cyst in segments IV, V and VIII (Figure 1). The serology for echinococcal disease and the tumor markers (carcinoembryonic antigen, carbohydrate antigen 19-9, α-fetoprotein) were normal, as was the routine lab work. We performed an ultrasonic pericystectomy and were able to remove the cyst with minimal damage to the surrounding liver tissue. We did not detect any other abnormalities during the operation. The patient was discharged on the eleventh postoperative day. Figure 1 Radiographic images of the central liver cyst. Magnetic resonance imaging (MRI) demonstrated a well-defined lobulated cystic lesion without enhancement after administration of liver-specific contrast material (gadoxetic acid) in the arterial, venous or delayed phase. A: MRI, T2, coronary reconstruction; B: MRI, T1, transversal; C: Contrast-enhanced computed tomography scan, transversal. Histopathology analysis revealed a lobulated cyst, filled with old blood and detritus. While the surrounding liver tissue was normal, immunostaining of the cyst showed strong coloring for estrogen and progesterone receptor as well as CK7, which proved the epithelial origin of the cyst. Since no atypical cells were detected, the diagnosis of a benign intrahepatic endometriosis was confirmed (Figure 2). Figure 2 Immunohistochemistry of the cyst. A: Cyst and normal liver tissue in HE staining, × 100; B: Immunohistochemistry for CK7, an epithelial marker, × 100. The intrahepatic vessels (arrows, endothelium) and the cystic wall (arrowheads) are indicated; C and D: Estrogen receptor and progesterone receptor staining of the cystic wall (respectively), × 100. Arrows indicate positive cells. Only 18 cases of this rare form of endometriosis are reported in the English literature (Table 1). Further, only one (5.5%) of these patients presented with cyclical pain in the upper right abdominal quadrant accompanying menstruation. In all other cases, patients presented with tenderness or pain, even jaundice, but no obvious connection to the menstrual cycle. This lack of a “typical” clinic makes it difficult to diagnose extragonadal endometriosis without histopathology. Twelve cases (67%) reported a previous history of endometriosis, mostly in a typical pelvic location, while 6 patients (33%) had no history of endometriosis at all. Thus the diagnosis of this condition should not be limited to patients with a known history of endometriosis. Also, 6 of 18 patients (33%) were postmenopausal, thus showing this condition is not limited to women of reproductive age. Due to the difficulty of diagnosing this condition by preoperative radiography, only seven (39%) of the previously described eighteen cases were diagnosed preoperatively. In these cases, a transhepatic biopsy was obtained and the diagnosis verified histologically. Although our patient underwent several invasive procedures previous to the operation at our hospital, unfortunately no histological sample was obtained. This prolonged the suffering of the patient and highlights the importance of both histological and microbiological samples in any recurrent cystic formation. Table 1 Case reports of intrahepatic endometriosis. The cause of endometriosis, first described by Rokitansky in 1860 in the pelvis, is still largely uncertain. Two major theories involve either the implantation of endometrial cells (implantation theory) or the metaplasia of the peritoneal epithelium (coelomic metaplasia theory) in the region of occurrence. Each theory, individually, fails to explain all cases of endometriosis. The frequent occurrence of retrograde menstruation is a strong argument for the implantation theory. Yet how these endometrial cells may reach atypical locations such as the brain, the heart[24,25] or, as in our case, the parenchyma of the liver, is hard to explain with this theory. The transport of endometrial cells via blood and lymph vessels, similar to the metastasis of cancerous cells, may be a possible explanation for these atypical locations[9,21,26]. Keichel et al found endometriosis-like cells in lymphatic vessels as well as endometriosis in locoregional lymph nodes in patients with deep infiltrating endometriosis. The metaplasia of (peritoneal) epithelium due to chronic inflammation or an unknown signaling cascade may be better suited to explain the occurrence of endometriosis in obscure locations, such as in the heart or even the male. Yet the observation that atypical endometriosis usually occurs in only one location in each individual is hard to resolve. If, as postulated by this theory, some signaling cascade prompts coelomic cells to develop into endometrial tissue, why does this usually happen in only one atypical location in a prone individual? Also, the high number of extragonadal, pelvic cases of endometriosis seems to favor a model in which proximity to the uterus may play an important role. In conclusion, intrahepatic endometriosis is a rare condition in women. Due to the difficulties of radiographic diagnosis and the “atypical” clinic (no cyclical pain and lack of dysmenorrhea), the diagnosis may only be reached preoperatively by transhepatic biopsy. Due to the potential adverse effects (risk of bleeding, possible dissemination of cells, biliary leakage) this procedure should be discussed individually. The operation of problematic cysts is a proven cure of the tenderness and pain mostly reported with this condition. A selective operation should be considered top priority, even if a malignant progression is very rare. Lifelong hormone therapy may also reduce the symptoms, as described in the case of Inal et al, but carries the risk of side effects and long-term dependence on medication. Rare conditions like intrahepatic endometriosis should always be considered as a differential diagnosis in women with recurrent hepatic cysts after surgical deroofing, regardless of age or previous medical history. In such cases, histology is essential and a pericystectomy should be performed.